If you’ve found that you need to more space at home but don’t want to move, then an extension project may well be for you. 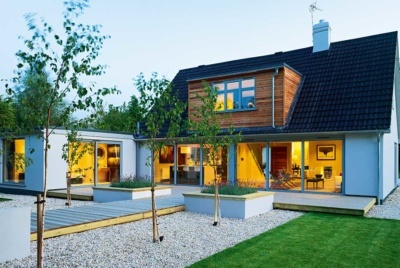 There will be numerous considerations to make before you commit to extending your home, from how much value an extension will add, whether an extension is economically viable (taking into account the ceiling value of similar properties in your area) as well as how the addition is going to work with your existing home, both internally and externally. 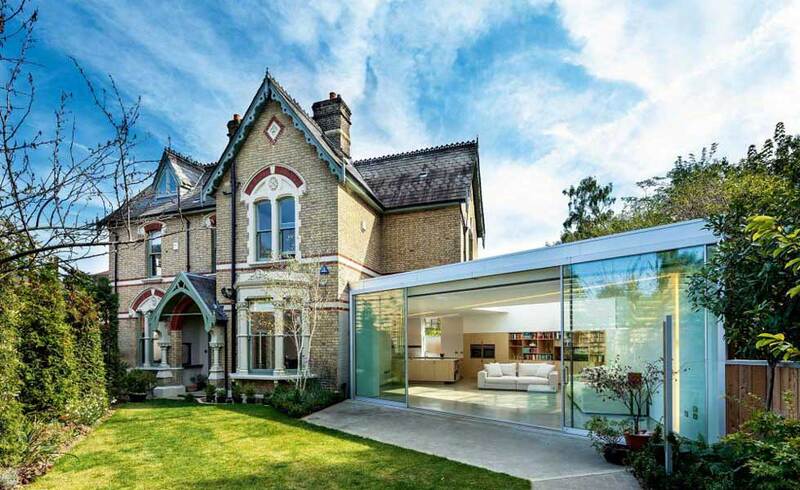 Here are 20 ideas for great ways to add space to your home with an extension. 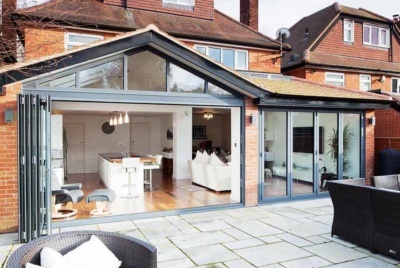 When adding an extension, it pays to reconfigure your existing space to make the new extension work. The reconfiguration will allow you to establish the optimum layout to make the most of access, views, natural light and privacy. Internal walls and doorways can be added or removed to achieve the space you require and to integrate any new extension, to ensure you get real value and use from it. Consider the position of the entrance and central hallway – which should lead efficiently to all main rooms – and the relationship between key spaces such as the proximity of the dining area to the kitchen. Building two storeys rather than one is a great idea for those who are looking to achieve maximum value for money with an extension, as the average cost per square metre (m²) is reduced by stretching the more expensive elements of roof and foundations over a larger area. You could also build an extra storey over the top of an existing single storey structure, such as a garage (providing the existing foundations and structure are adequate enough). When extending your home, choose either a contrasting but complementary style, or make the extension look like it has always been there. The former is much easier to pull off well. If you decide on the latter, make sure you copy the key design elements, roof pitch, materials and details like the brick bond and even the mortar colour, or your new addition will look wrong. Smaller conservatories often don’t require planning permission, are excluded from the Building Regulations and are fairly inexpensive, making them one of the most popular home improvements. A conservatory can have its drawbacks, however: it must be separated from the house by external doors to reduce energy loss, and it can be difficult to heat in winter and keep cool in summer. A popular alternative is to build a sunroom — an extension with large areas of glazing, but with a conventional insulated roof and typically one insulated wall (particularly the one facing the boundary). The space can be open to the rest of the house, and the temperature can be controlled more easily. Tall ceilings can transform the way a room feels — larger rooms especially are made to feel even more spacious and impressive. An extension gives scope to add this feature for relatively little cost, either by digging down to lower the floor level, or by building up. In a two-storey extension this may result in a split-level on the first floor, which can add interest. When it comes to period homes, it can be especially difficult to find the right extension design to complement the existing property. One possible solution is to add the new space as an entirely separate building in a sympathetic style – either traditional or contemporary – and to join the two with a fully glazed walkway. 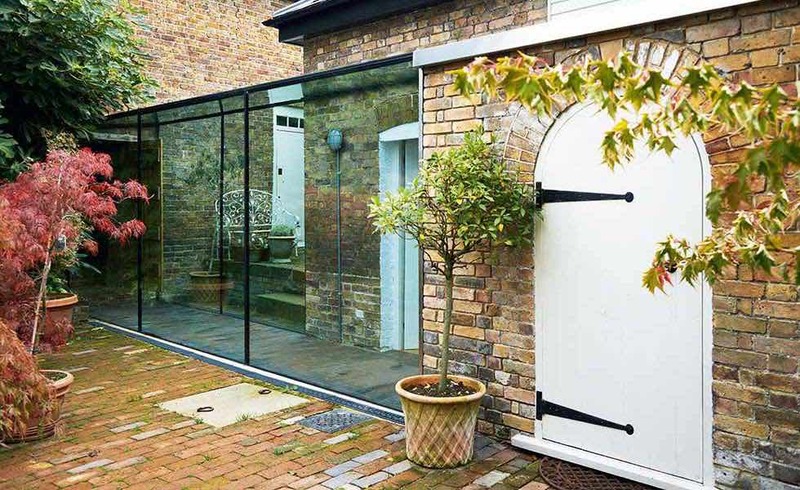 Choosing structural glazing for the walkway will reduce its visual impact and leave the original building’s character unaltered. This is a device favoured by many conservation officers and can work well in linking existing period buildings, too. A covered outdoor living area provides somewhere to sit or eat outside during the warmer months, but is protected from either too much sunlight or light summer rainfall. You could choose a traditional option, such as a loggia or veranda, or go more contemporary space, set beneath a projecting flat roof supported by slender steel posts, perhaps with an area of slatted sun louvres. Pocket door systems are available off the shelf (try Em-B) or you can buy the running gear separately (try Häfele) and have doors made up to suit your own design. Introducing lots of natural light is one of the key ingredients in successful extension design. Where a potential new window opening will look out onto a neighbour, the street, a side alley or directly onto a boundary, consider using obscured glazing, so you get the benefit of daylight but without anyone being able to look in or out. Traditional options include textured or stained glass and glass blocks, and more contemporary options include acid-etched or sand-blasted glass and coloured glass. With increasing emphasis on energy efficiency, many people are blocking up open chimney flues and air vents or excluding them from their extension plans. Yet there are two energy-efficient options that still give the feature and comfort of real flames. Flueless gas fires are 100% energy efficient and require no chimney or flue: a catalytic converter cleans all harmful combustion gases, producing just water and CO2. Designs include traditional fireplaces and stoves, and contemporary hole-in-the-wall models. The second choice is a room-sealed woodburning stove, connected to an internal air source to prevent any draughts. They are highly energy efficient and there are some exciting modern design options. A well thought out lighting scheme will create a great atmosphere in your new space, allowing you to use different combinations of circuits for different activities. As well as ambient lighting to provide basic background light for everyday activities, include accent lighting in the form of directional spotlights, uplights, downlights, wall washes, baffled (concealed source) lights, table lamps and standard lamps to create light and shade, which is key for atmosphere. Add decorative lamps, for instance, above a kitchen island or dining table as feature lighting. Independent control of each circuit using dimmer switches or smart switches with preset options is essential. Contemporary extensions with glass walls, polished stone or concrete floors and crisp, clean lines can look fantastic, but they can also create acoustic problems as sound reverberates from one solid flat surface to another. Such problems need to be overcome by introducing soft sound-absorbent materials into the room. However, rugs, curtains and soft furniture are not always appropriate — in a dining or kitchen area, for instance. An alternative is to fit some form of acoustic panels. These can be fitted to the walls as textured profiled panels like wall art, or flat panels printed with any chosen image. Position window openings to frame the best views and to improve privacy — by screening off any unsightly external features or neighbouring properties. Options include projecting bay windows and oriel windows set at an angle, with one or both reveals designed to act as a blinker. Think about the shape of the window and the height of the cill, too — narrow elongated windows can create wonderful panoramic aspects, or be designed to frame a particular landscape view. Low-level windows can be effective at creating views when sitting or lying in bed. Window seats can be another useful device here. If you are looking to create a contemporary designer kitchen in your extension but don’t have the budget for a bespoke design, create your own using modular units, combined with end panels, worktops and other features sourced elsewhere to recreate the same look. Most trade suppliers do not offer panels large enough to create big islands or floor-to-ceiling banks of units to form an ‘appliance wall’, without obvious joints. You can overcome this by buying large sheets of MFC (melamine-faced chipboard) in a matching or complementary finish from a specialist such as Timbmet together with matching iron-on edging strips. Sliding metal timber unit doors to suit standard-size cupboard units are also available from CK Kitchens. Where the garden is large enough, an annexe might well prove a more sensible and manageable solution than extending the existing house. A garden building might provide additional games space, but would be much more exciting as self-sufficient accommodation, providing kitchen, bedroom and bathroom spaces. Cantilevering is a useful device for creating design features such as balconies, mezzanines or whole storeys that project out from the floor below and appear to float with no visible means of support. If you decide to go for a new staircase when extending, consider making it a key design feature. Options include floating cantilevered treads, open treads, glass or metal balustrading, galleried landings, sweeping curves and spirals. 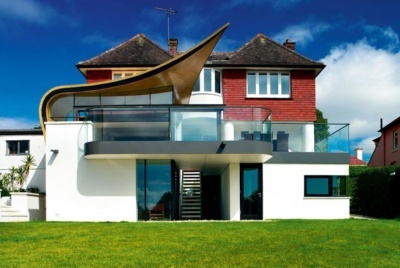 It is probably the best opportunity to create an exciting architectural feature in the home. 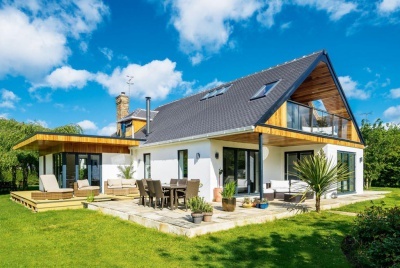 Instead of building an extension to match your property’s existing architectural style, the project can become part of an overall redesign scheme that completely transforms your home’s appearance. This is a good technique for adding character and value to buildings that are bland, utilitarian, unfashionable, or which have been extended unsympathetic­ally in the past. You might be able to undertake the remodelling work under Permitted Development rights (whereby planning permission is not required), but do check with your local planning authority first. A vaulted ceiling with exposed oak beams makes a great design feature that gives a room instant character — ideal for a kitchen, sitting room or master bedroom. An entirely oak frame extension is ideally suited to a rustic-style property such as a cottage, farmhouse or a barn conversion, or an Arts & Crafts home. A cost-effective option is to combine an oak frame principal roof structure (principal rafters, collar, tie beams, braces, ridge and purlins) with softwood rafters — the latter hidden behind plasterboard and insulation. An oak frame extension can be encased within structural insulated panels (SIPs) or any other construction system to ensure it meets Building Regs’ standards of thermal efficiency. Bringing daylight into your extension from more than one direction to add multiple layers of light and shade, will greatly enhance the quality of space. As well as maximising window and glazed door openings, consider introducing a bank of rooflights, a roof lantern or a clerestory (a row of windows set just below ceiling level and above the eye level) to bring in light from above. In addition to bringing light deep into the floorplan of an extended home, these ideas will also help address issues regarding overlooking and privacy. Did you know that by starting an extension project, you could invalidate your existing home insurance policy? Excellent article! I particularly appreciate your emphasis on the importance of lighting … it makes all the difference in the world to a space. Pocket doors are also a great idea that I hadn’t considered.